Some twenty families are bitter over the acquisition of their land for the construction of an international cricket stadium in Dambulla. The relocated villagers say they face hardships ranging from the procurement of water to loss of income due to the take-over of land which they claim provided them with bountiful harvests for a living. To pave the way for the construction of the 400-million rupee cricket arena, the villagers have been relocated on an adjoining patch of land. And although no open protests have taken place, the atmosphere surrounding the proposed site of the stadium is somewhat uneasy as mixed feelings have developed between the relocated villagers and those optimistic of the results of the project. "How can we cultivate a few perches after having reaped the benefits from more than an acre. We have no place now to keep even a cow", said one villager who identified himself as R. M. Dharmadasa. Some of the aggrieved villagers requested anonymity for security reasons, but others boldly asserted themselves saying it was better to end their lives than starve. "We have to fight for our rights and you can put our names and all what we say on paper. I have no money today to buy milk for my kids and I feel like committing suicide", another who identified himself as D. M. Dehikumbura angrily said. He said one of his neighbours who built a house valued at Rs. 300,000 with money earned from an overseas job almost ended his life when it was demolished to make way for the stadium complex. The Board of Control for Cricket in Sri Lanka earmarked Dambulla as a venue for an international stadium as the region offered plentiful sunshine compatible with the demands of the sport. Cricket officials in Colombo also supported the project saying it would generate employment for rural youth and boost tourism in the region which is famous for its ancient Buddhist heritage and tranquil landscaping. But relocated youthful residents were sceptical about a promise of some 20 permanent job opportunities at the request of the region's top Buddhist prelate although saying they were not opposed to cricket and the stadium. One relocated villager pointed to a small plot of manioc (yam) plants saying it bore a marked difference from rich harvests of chillies, bananas and winged beans he previously cultivated. But the construction of a state-of-the-art cricket venue has also ignited a burning desire among some Dambulla's residents to boast of a symbol of pride. "There's nowhere else we could go to see international cricket and we like to have a venue here. We consider it an honour to have one built here", said Sarath Welivita, a commercial vehicle driver who acted as self-styled spokesman of a band of youth. The land on which the stadium complex is to be built belongs to a major Buddhist monastery, the Rock Temple. Its chief resident monk the Ven. 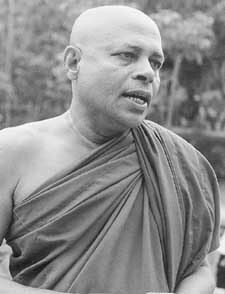 Inamaluwe Sumangala Thera said the construction of an international cricket stadium posed no threat to Buddhism and can be considered part of the development of Dambulla which occupies a central spot on the map. The head monk does not believe that the relocated villagers have lost out on anything but says the local residents have instead gained and are poised to benefit further. He referred to the protesting families as people who were not established cultivators but labourers who had initially benefited by his intervention that brought them half an acre of land each on which to live without fear of ejection. "As far as I know these people did not cultivate the land as they say. Under our policy of leasing land we want people to genuinely cultivate products like coconut, jak and breadfruit and not just some chillies", he said. Ven. 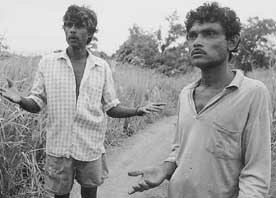 Sumangala charged that before their relocation the villagers had indulged in shady deals like leasing out the land to others for cultivation for a fee or taking a share of the income from produce sold. He said the relocated villagers for their part are guilty of not keeping to their obligations in accordance with agreements reached between them and the temple authorities. Ven. Sumangala Thera said the resettled villagers previously lived in mud huts and now own homes made of bricks and cement following successful discussions he had with Colombo's cricket officials. "If you had come here say six months ago, you could have seen the position of their dwellings. But now they each have a house worth seventy five thousand rupees and half an acre of land which will have far greater value if the Sports complex in Dambulla becomes a reality. The only difference is that they have moved 50 metres away from their previous location". He said prospects were bright for some of the resettled families who are genuinely interested in cultivation as land will also be provided by the Divisional Secretary. The venerable clergyman said the temple decided to lease out the land on an assurance given by cricket officials in Colombo that the sporting project would open up some 200 permanent job opportunities as well as providing casual employment for 2000 more inhabitants. He said temple land had been previously leased out for the construction of schools, houses, employment generating projects and playgrounds and the allocation of 40 perches of land for an international sports stadium added to the concept. He dismisses suggestions that an international cricket stadium could spoil the serene atmosphere and sanctity for which Dambulla is renowned. "The construction of this stadium will do more good rather than harm and I can't think of sport affecting the religious environment in Dambulla", he said. "It is with great happiness that we welcome Ceylon Cold Stores as the new sponsors for inter school cricket," said Sri Lanka Schools' Cricket Association President Mr.H.L.B Gomez at the press briefing to announce the new sponsors. Speaking further Mr Gomez said: "This being the 50st year of our association, we are happy to have a new sponsor. If you have noticed most of the cricketers in the present Sri Lanka cricket team shone at school cricket and have fought their way into the national team." Winding up his speech Mr Gomez said: "We hope with the new sponorship more world class cricketers will emerge." For the next five years the under-19 inter school cricket tournaments (knock-out and league) will be sponsored by Ceylon Cold Stores and the tournaments will be played for the Lemonade Cup. Ceylon Cold Stores have taken over from Pure Beverages, sole agents for Coca-Cola. Marketing Manager for Ceylon Cold Stores Mr Laksiri Wickremage speaking at the Press Conference said: " Since inter-school cricket is the nursery for national cricket, it is with great pleasure and happiness that we are tying up with the School Cricket Association. "We hope this sponsorship will be of immense help to inter school cricket. We hope more world class players such as the likes of Sanath Jayasuriya Arjuna Ranatunga, Aravinda De Silva and Roshan Mahanama will emerge through our sponsorship". Mr Wickremage said they had plans to telecast the final live but unhappily due to the prevailing bad weather conditions they had to put off the idea. Thirteen year old Dushinka Subramanium underscored her abilty as an up and coming player when she dazzled at the recently concluded 'Bandarawela Ranking Tennis Tournament' by grabbing three titles. The student of Asian International School made her father, Suresh Subramanium, look at her performance with awe and wonder when she completed her rout by winning the Mixed Doubles, Girls Under 18 Singles and Girls Under 14 tournaments. The tournament also held a memorable moment for her when she, together with Arjan Perera, got the opportunity to beat her father and Manisha Abeywardane in the Mixed Doubles event . She also annexed the Girls Under 18 Singles and Girls Under 14 Singles events by downing Manisha Perera and Diana Alles respectively. Mens Singles - Arjan Perera beat Dinuka Ranaweera 6/4, 6/4. Mixed Doubles - Arjan Perera and Dushinka Subramanium beat Suresh Subramanium and Manisha Abeywardane 6/2, 6/4. Womens Singles - Andrea Breher beat Dhushinka Subramanium 6/3, 7/6. Boys Under 18 Singles - Eran Weerakoon beat Dinuka Ranaweera 6/1, 6/2. Boys Under 14 Doubles - Nishan Rajakaruna and Sasitha Wickremasinghe beat Basitha Kariyawasam and Revantha Subramanium 5/1 , w/o. Girls Under 18 Singles - Dushinka Subramanium beat Manisha Perera 7/6, 6/4. Boys Under 16 Singles -Dinuka Ranaweera beat Eran Weerakoon 6/3, 6/0. Boys Under 14 Singles - Nishan Rajakaruna beat Sasitha Wickremasinghe 3/6, 6/0, 6/4. Girls Under 14 Singles - Dushinka Subramanium beat Diana Alles 6/1, 6/2. Veterans Singles - Dr. B.J.C.Perera beat Dr. Ramaswamy 6/2, 7/5. Veterans Doubles - Dr B.J.C.Perera and Mervyn Fernando beat Rohan Abeywardane and Dr. R. Ramaswamy 6/2, 6/3. Sri Lanka will meet Nepal today in the Coca-Cola South Asian Football Federation (SAFF) Championship encounter at the Nehru Stadium in Goa today. Sri Lanka are the favourites to win which will put them on top of the points table. Yesterday, Bangladesh scored a 4-0 win over Pakistan to occupy top spot in Group A with India close behind. Bangladesh led 2-0 at half time. Bangladesh with a well earned draw against champions India, assured themselves of a semi final with a close 1-0 win over Pakistan. Center forward Iqbal Hossain lodged the ball in after a goal mouth melee for Bangladesh. Pakistan trying to make amends for the equaliser was prevented by doing so by the agile Aminal Haq at goal, who stopped two bullet like shots in quick succession from inside the penalty box. Playing with a better height advantage Pakistan found it difficult to match their opponents who played a faster game with quick and nippy passes. Bangladesh going for the kill, made their first substitution bringing in Rakib Hossain instead of striker Anwar Pervaiz. Pakistan the favourites to win this encounter made a double change replacing the goalie with Zahid Taj and Babar Mahmood came instead of fullback Pervaiz. Bangladesh could have made their margin of victory by at least 8 goals to nil in the last ten minutes of play, but inaccurate kicking let them down.Alfaz Ahmed of Bangladesh was picked as the best player of the match and was awarded 10,000 Indian Rupees. Isipatana started the season with a bang when they steamrolled over D.S.Senanayake by 79 points (seven goals and six tries) in an inter school A Division Group 'C' rugby match at Havelock Park yesterday. Isipatana opened scoring in the third minute through a try by centre Veediya Bandara, which was unconverted.This gave the home team a 5-0 lead. Immediately afterwards came the try of the match as wing three quarter Hamesh Gunaratne collected the ball 15 meters from his own goal line, slipped two tackles and then burst through covering almost 75 metre to score under the posts for an converted try to give them a12 - 0 lead. Another 11 tries followed out of which eight were scored by winger Hamesh Gunaratne, who made some great runs. The defending Carlsberg 'A' division rugby champions CR and FC got off to a winning start when they scored a 28 points (a goal, three tries and two penalties) to nil win over Sri Lanka Navy in a inter club rugby match at Londgen place yesterday. The red shirts led 15-nil at the breather. Although CR were expected to go on a scoring spree they had to face a strong challenge from the visitors who gave a breathtaking display of bone crushing tackling. In the first half they scored a try through skipper Champika Nishantha and one through former Thomian and No.8 Savantha de Saram. One of these tries was converted by Zulfikar Halmeedeen who also put over a penalty to give CR a 15-0 lead at half time. In the second half CR scored one penalty and two more tries. The two tries in the second half were by flanker Alfred Hensmen and Shamly Nawaz. Both these tries were unconverted while the penalty was put over by Halmeedeen. Last Friday the 1999 inter club rugby season got off to a stunning start as Army scored a surprising 7 points( one goal) to 6 ( two penalties) win over Havelocks at Havelock Park. The Army's winning try was scored by full back T.A.Silva who converted it himself. The two penalties for Havies was put over by former Mahanama captain Nalin Dissanayake. *Today up in the hills Police will play host to Kandy and in Colombo CH and FC will take on Sri Lanka Air Force. Both matches will start at 5.00 pm. MUMBAI, India's Srinivas Venkatraghavan will stand in the opening World Cup match between England and Sri Lanka at Lord's on May 14. A National Grid ICC Panel umpire, Venkatraghavan, considered to be among the top three (David Shepherd and Steve Bucknor are the others), will stand in four more league matches that will conclude on May 31. His co-umpire for the first match is South Africa's Rudi Koertzen. When Jockey Rahul Shinde came over to ride Chandran Rutnam's horse he was not aware that it was going to be so easy. Garabandel, Aragon and Gandelf were in such good condition there seem to be no competition. Rahul won all his races leading from start to finish except for one race. Even that too Rahul could have won leading from the front, as Gandelf is our best sprinter and could have won very easily, said the trainer Mohan. Rutnam teamed up with Mohan when Film Locations required horses for a foreign film and Mohan was given the job being the only qualified man. Well, it was a very successful racing season for the de Lanerolle's and Chandran Rutnam. They did the possible, winning four of the five Thoroughbred races they entered, their champion horse Garabendel winning the mile and the nine-furlong Governor's Cup. Mr. Cyrus S. Poonawalla of Poonawalla Stud Farms, Poona, India was the sponsor of the last day's events. The sterling silver cup brought down from India for the Governor's Cup was the main event of the day. Two horses from the de Zoysa stables, Match Point and Royal Athlete, Gamani Kodituwakku's Dancing Brave and two other horses Aragon and Garabandel from the Saddle-Up Riding School took the field for this main event. Garabandel ridden by Rahul Shinde took the lead after the first bend and never seemed to be tiring and won the race with ease. Match Point ridden by S. Kapoor of India who was the favourite would have disappointed Mr. Poonawalla who was the chief guest along with the Indian High Commissioner who was present at the meet. Claude de Silva, trainer of Match Point remarked that the horses came from Poonawalla Stud Farm too late and they did not have sufficient training. The Turf Officials should be commended for the wonderful meet conducted. Mr. Poonawalla promised to help the club in all their efforts and one would expect better racing in the future. The de Lanerolle's Mohan Sr. and Jr. teamed up with Chandran Rutnam to win the classics at the horse race meet this season. They cleaned up four of the five races they entered on the first day winning the Sporting Times Cup on Aragon. The second day they won both thoroughbred races on Gandelf and Garabandel finishing off with the Sterling Silver Poonawalla Governor's Cup presented by the Poonawalla Estate Stud and Agri Farm of Poona, India with their champion Garabandel. Cyrus Poonawalla himself who was the guest of honour at the meet presented the trophy. He may have been disappointed that Match Point from Ajantha de Zoysa's stables finished second. Match Point was specially imported from Poonawalla Stud Farms this time to try for the Governor's Cup. Mohan Jr. rushed to Chennai before the races to bring a Jockey. Rahul Shinde whom they invited turned out to be the most popular Jockey in N'Eliya. He was a good professional who won the best jockey's trophy, loved by all and it is mentioned that Rahul will be seen in action at many more meets in the future. Chandran Rutnam placed all his confidence in Mohan Jr. As co-owner/trainer, he is the only qualified (British Horse Society) equestrian manager in this country. 'It is no wonder that all the thoroughbred races were easily won,' he says. We did not have oats and other extras as the others had. If we had those, our horses would have been a further ten lengths in front. They met when Film Locations hired Mohan's horses for a film. Rutnam at once recognized the young man's talent and requested Mohan to bring him a horse from India. Is a leading cricketer cut-up that one of his team-mates is not listening to what he says. Rover understands that this leading player has told another not to forget the "support" he gave him in the recent past. A classic case of someone demanding loyalty. Trinity College it is understood is making life difficult for one of its rival rugby schools Isipatana. As this year's host team, Isipatana fixed May 8 and the Sugathadasa Stadium as date and venue for the annual encounter. Rover learns that Trinity are now pushing for a change in the date citing a match against home town school Vidyartha as the reason for their call for a change. In the eyes of the public, a call for a change of date may be a minor issue, but it certainly leaves a bad taste in the mouth of the team entitled to host a fixture in accordance with the regular formality. In recent years it has been Isipatana that has won admiration for being a very sporty side. The rebel rugby referees (they are now no more rebels) have succeeded in negotiations with the Referees Society to look into their interests in the larger interest of the game. Rover is happy to note that everything is now smooth-sailing for both the Society and its members both "senior" and "junior". It seems the troublemaker has now been identified. Hats off to the Society's top men. A national coach of a leading sport in Sri Lanka is coaching a leading school in Colombo for a tidy sum. Many lips were wagging how come he being a serviceman is allowed to do this in the leading clubs involved in this popular sport. The sporty one was heard by many saying that he was not worried at all in the on-going clash, and given the chance to appoint a committee to control this particular sport, he would appoint the very same persons to run the affairs of this particular sports controlling body, if ousted, that is. The 40 acres land in Dambulla, Rover learns, has been offered on lease per acre at Rs. 1,500 only for a period of 29 years and will be renewed afterwards for another term after consultation between the lawyers. This stadium once built will be named, Rover learns, in the surname of a grandfather born in Dambulla who happens to be close to an official of the Cricket Board.